In news that should surprise precisely no one, there will be a convertible version of the all-new eighth-generation 911 introduced last fall. In fact, here it is, the 2020 Porsche 911 Cabriolet. Also of no surprise: It’ll once again be available in rear-wheel drive Carrera S and all-wheel-drive Carrera 4S guises. We’ll have to hold our feigned shock a bit longer for the Turbo Cabriolet. 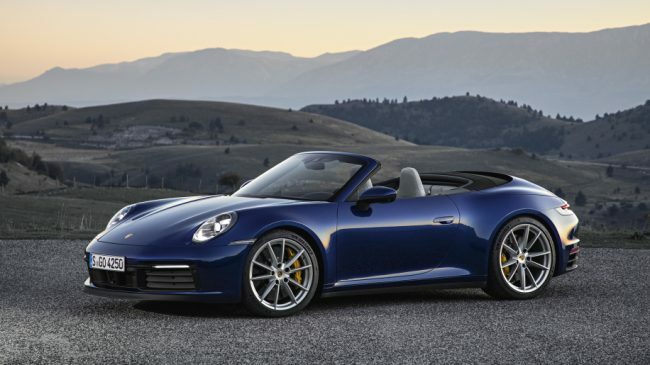 As expected, the 911 Carrera S Cabriolet possesses all of the improvements, new features and redesigned elements found in the coupe — albeit with a fabric roof and a consequent reduction in structural rigidity. We dug into what makes the 2020 911 all-new during the L.A. Auto Show, should you need a refresher. What makes the 2020 911 Cabriolet new largely comes down to its roof. It features magnesium support elements and new hydraulics that result in smoother and quicker operation. How quick? Try 12 seconds versus the outgoing car’s 13. Boom, progress. Like the old car, though, it can still be raised and lowered at speeds as high as 31 mph, and is once again joined by a clever power-operated wind deflector that should do a similarly incredible job of reducing airflow and therefore air fussing when cruising at high speed. One key addition to the Cabriolet lineup is the availability of the PASM Sport Suspension that features stiffer springs and sway bars, and a ride height reduction of 0.39 inches. It was previously only offered on S and GTS Coupe models. Still, you can order a PDK-equipped Cabriolet right now with deliveries expected to start late this summer. The base price for the Carrera S Cabriolet is $127,350, including the $1,250 destination charge. The Carrera 4S Cabriolet starts at $134,650. Of course, “starts” is the operative word, as like every other Porsche, there will be an endless list of performance, comfort, convenience and customization options that will skyrocket the price faster than you can lower the roof. As for the design, we’re not quite sure the new full-width taillight design works as well on the Cabriolet. Or, at least, it contributes to a sort of two-tiered hunchback look with the roof down. The rear end on the old car was a little more pert — this one looks like it’s carrying around an insect-like abdomen. Then again, maybe it’s just the dark colors and the photograph angles shown. Besides, the drop-top 911 has never had the most graceful profile.